This belly portrait was done at the end of March for Katie - her new baby boy is due at the end of April and her 4-year-old Marleigh is very excited about her soon-to-be baby brother. The baby is a Kicker! What with all his kicking, Katie decided she wanted to give him something to kick besides her insides, so we came up with the concept of a football goal post. 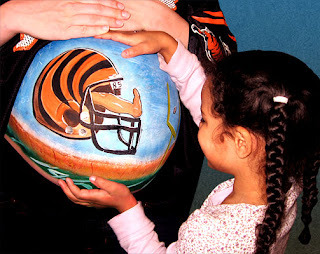 Since Dad's a big Cincinnati Bengals fan, the Bengals helmet design fit in perfectly and the whole thing turned out really nice. I used Wolfe Brother's paint for the whole design, and used silver stick-on gems as the "screws" on the helmet. (Of course, when I got the gems out, Marleigh got all excited and when I next looked up she had them stuck all over her whole face! Oh my.) The whole painting took about an hour or so. We got a lot of great photos, but the one above is my favorite. Marleigh is such a camera-hog.. she wouldn't get out of the shot, so we just went with it! I'm glad we did.. having her in the picture too really adds to the portrait. Here are a few more, for fun.. enjoy!